Here is another project that I decided that I want to put my own personal touch on. Well, this weekend we got some BEAUTIFUL weather, so I painted a bunch of furniture. This is what it looked like, just painted. I LOVE poppy's...I don't know what it is about them...I just love them...so I decided that I wanted this to have a poppy on it. I looked at tons of pictures online and got one I thought would work for this nightstand. This is not the type of picture you can "just transfer" This one had to be painted. So I got to drawing it on, and started painting. I hope you have a BEAUTIFUL day!!!!! Wow. Awesome job painting that poppy! I love how it turned out. THIS is what the table I am working on is missing!! How soon can you be here? Oh so gorgeous! I just love the color, and the poppy shading. Will this table be going to your booth to replace the pretty poppy dresser you sold? WOW! This is beautiful! You are so talented. Great job! Wow! You have a real gift, lucky lady!! It's really a beautiful piece. Love this one the best! You are such a great painter! You're very talented! that looks amazing. Wow, so that's pretty stinkin' stunning! You do BEAUTIFUL work! I'd love for you to come by the Head to Head Showdown link party, going on right now at www.icantstopcrafting.blogspot.com to share this great project! I hope to see you there! This is so beautiful and unique. I absolutely love it. Saw this on Polish the Stars.....it is beautiful....I love pen and ink especially doing flowers so I was immediately drawn to your piece. I love the way you used white to enhance it even more....beautifully done! Outstanding job! It's really beautiful! You are very talented. I would so love to have you share this project at my Wednesday party! this piece is just stunning! beautiful! I remember the first time I saw a poppy in real life - it was at Disneyland! Thanks so much for linking up to our Friday FREE-FOR-ALL! If you haven't already, stop back to check out the new entries and click the "like" button to vote for those you like. We'll see who the favs are later this week. that is adorable! love the poppy! This is divine! Such talent. 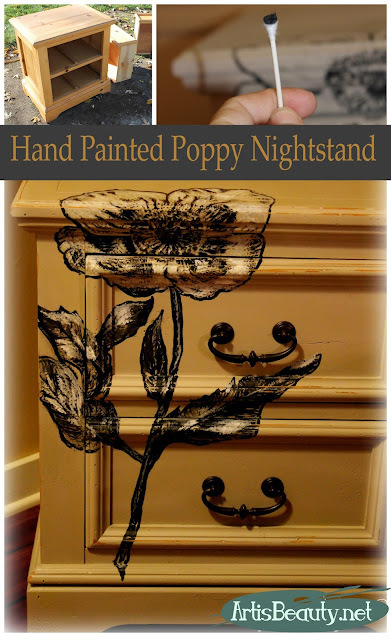 Wow you did a great job handpainting the nightstand! that is gorgeous! And I love poppies! Absolutely gorgeous. I just did some poppy paintings for my living room. I understand what you mean about loving them. I love how you wrapped it around the piece instead of just painting it on the front. Really beautiful! Beautifully painted piece! It was lovely painted, but the poppy certainly puts your unique stamp on it. This is beautiful! I absolutely love poppies...and black and white. I would love to try and recreate this, however even stick figures are a struggle for me! This is incredible!!! You are a true artist. Gorge, as usual! Your painted birch coffee table made a huge impression on my readers, by the way. Thanks for linking up to Refresh Your Nest Friday! Very pretty. I can't believe you can "free hand" something like this. Thanks for linking it up to Fabulous Friday at Faith, Trust, & Pixie Dust. Your nightstand is really gorgeous! You did such a beautiful job painting the poppy! Holy Shmoley- Great paint job lady!Thanks so much for linking up at my first ever party and helping make it a big success! I love what you did with this nightstand! Thank you for sharing at my party!